Art League Rhode Island first sponsored and inaugurated the gallery on the third floor of Veterans Memorial Auditorium (The VETS) in 2014. Since then we’ve enjoyed sharing an address with The VETS, which is listed on the National Register of Historic Places. The VETS has held a unique place in the cultural life of Rhode Island as a performance venue. With our continued sponsorship of The VETS Gallery we are proud to enhance that cultural experience. The VETS Gallery is open during performances and by appointment. To schedule your visit to The VETS Gallery please email us at artleagueri@gmail.com. 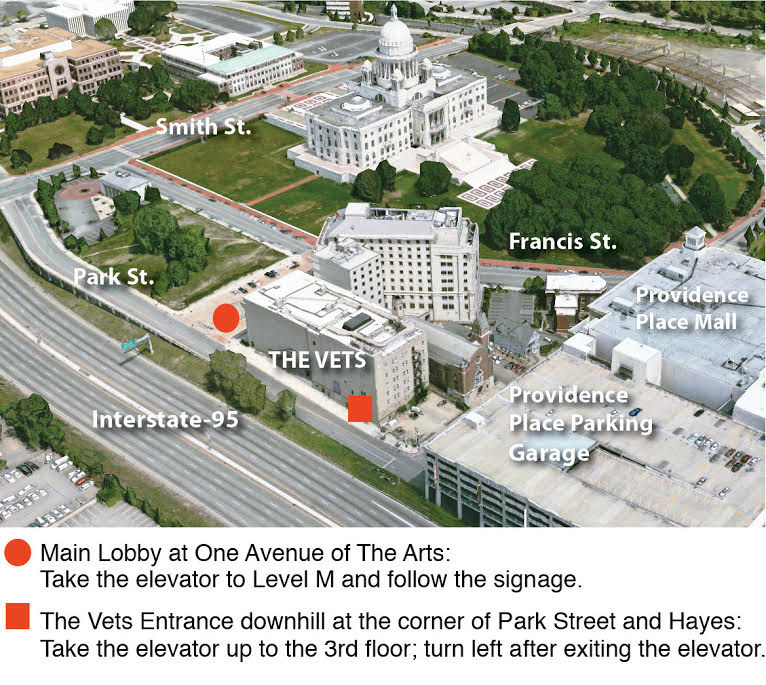 Parking is available on the street or in the Providence Place Mall parking lot, located immediately behind The VETS. If you park at the Mall the Park Street entrance to The VETS gives you easy access to the gallery. Secure paid parking is available at the Providence Place Mall Stateside Entrance (Nordstrom/north side of the mall), directly behind The VETS at a rate of $2.00 for the first 5 hours. To exit the lot on foot take the North elevators or stairs located at the rear of Nordstrom to level “B” (Hayes Street). This will bring you to street level directly behind the theater. Enter the building on the Park St. side entrance (highway side) or continue up the sidewalk to the theater front entrance.